What’s the healthiest bread to eat? The hardest part of a nutrition conversation is usually to zoom out. Questions like, “Which bread is better?” do matter… but only sort of. Spoiler alert: If you’re only here for my bread recommendations, skip to the very bottom. once they’re in the body. What is a whole grain product? All flour begins as a whole grain- that’s how it grows on the plant. 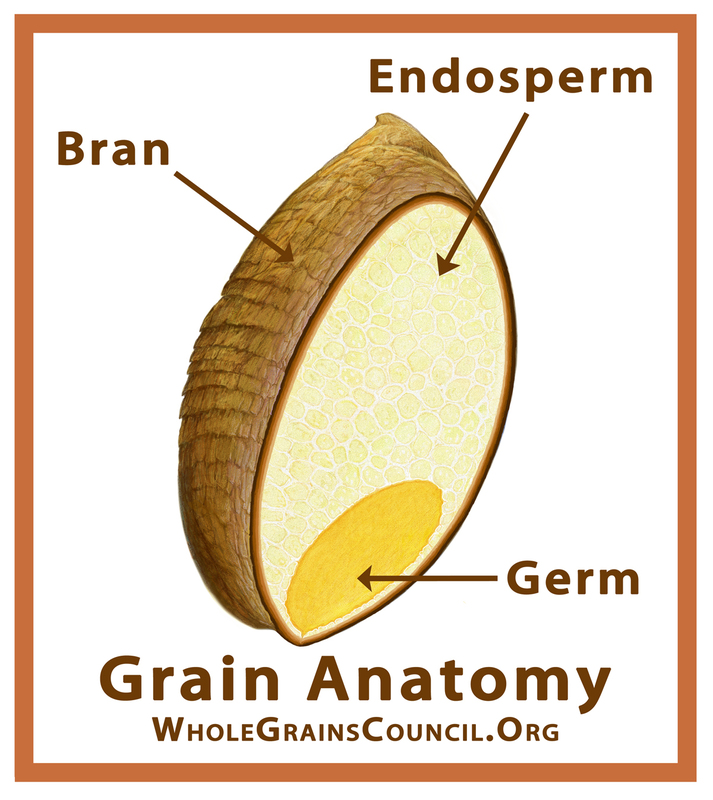 As you can see from the picture, a whole grain contains the bran (outer husk), germ (can sprout a new plant), and endosperm (starch that serves as food for the germ if needed). As long as these three components remain within the food, it may be considered a whole grain product. 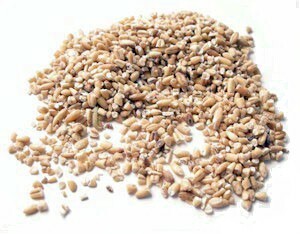 A refined grain has had the husk and germ removed so that only the starch remains. In most manufactured goods, this is listed as white or enriched white flour in the ingredients list. Removing the germ extends the shelf life of a product, as the fats in the germ can oxidize and become rancid over time. In order to do this, the outer husk is removed as well. For a long time, refined (white) baked goods, cereals, white rice, and other pantry staples were preferred by consumers as well as manufacturers. Recently, though, shopper trends are shifting to demand healthier ingredients, including whole grains. This is causing many improvements, but it’s still hard to know which products are actually good for you and which are just capitalizing on trends in advertising to appear more wholesome. In order to answer this question, we must look at another piece of the puzzle: Processing. Picture a grain of rice. Now picture a speck of flour. One is smaller than the other… but both can be considered a whole grain because the bran and germ are intact. The difference is in the processing. Un-processed whole grains have not been physically or chemically broken down from their original form. Comparing steel cut oats to quick oats represents the difference: Both theoretically contain the same macro and micro nutrients, but quick oats will be cooked and digested faster than steel cut oats. What’s the problem with that? Well, blood sugar, for one. A bowl of quick oats takes less work to digest and so the glucose contained therein quickly rushes into the blood stream. Blood sugar spikes, such as those that might follow a piece of white bread or quick oats, can cause damage over time—contributing to heart disease, metabolic syndrome, and insulin resistance. They also have the immediate effect of making us hungry more quickly following a meal. A bowl of steel cut oats would enter the body at a slower rate, keeping us feeling satisfied for a longer period of time. Bottom line: Carbohydrates are used by the body for energy and are most beneficial when they provide a steady stream of glucose instead of a quick spike. Unrefined whole grains let glucose into the blood stream at a steady rate due to the fats and fiber found in the husk and grain as well as the mechanical digestion required to break down the intact particles. Eating carbohydrates in the setting of a balanced meal provides further protection against spikes in blood sugar. Back to the original question- does the bread we eat matter? All Bread is made from flour, which is a processed grain. Therefore, whole wheat or otherwise, most breads will do the same thing to your blood sugar. Whole wheat breads may be the same price as white breads, so choose wheat whenever possible. Organic, sprouted, and artisanal options, however, usually cost more than other choices. As someone shopping on a budget, if I’m choosing between a $2 loaf of bread and a $5 loaf of bread, the difference could mean a bag of carrots. disease prevention to better satiety throughout the day. For now, the evidence does not support it. But what if you make your own bread- what’s the difference? Sodium, sugar, and gluten, potentially. 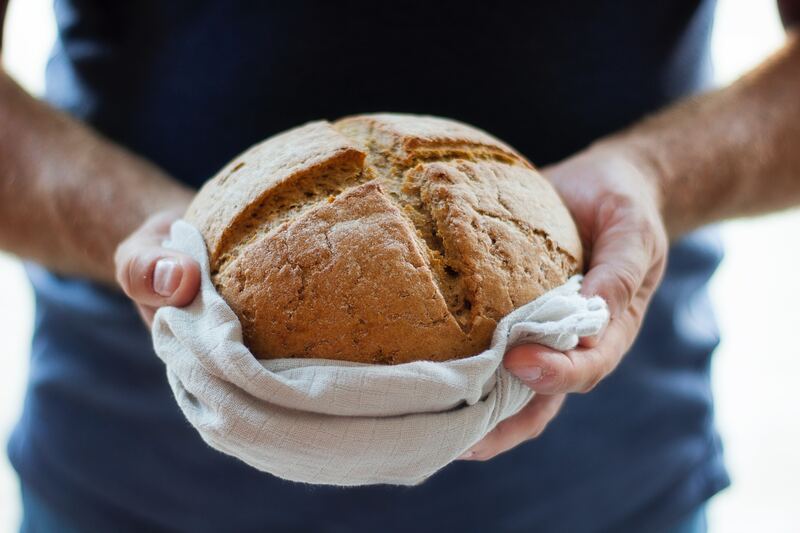 If you’ve ever tried to make a decision between two breads at the supermarket, you may have realized that the list of ingredients includes many things other than the 4 necessary ingredients: Flour, water, salt, and yeast. Bread baked at home can cut out preservatives and gluten that may be added to extend shelf life and to cut corners in production. As with all homemade versions, bread you make yourself can easily include higher-quality ingredients for a lower price. With ingredients like white whole wheat flour from King Arthur Flour, whole grains have never tasted so good. Cooking at home is the best way to incorporate un-processed, unrefined grains into your diet. Grains purchased in bulk are inexpensive and can be prepared many different ways. Looking for specific product suggestions? Nature’s Own whole wheat bread is my favorite budget bread. My upgrade pick for an optimal combination of low-sodium and low-sugar with more fiber and healthy fats is Power Seed by Dave’s Killer Bread. Next Give The Boss a Treat Today!